MIDDLEBURY, Vt. – Strong returns in venture capital investments and private equities and public equity markets helped generate a strong investment return of 9.7 percent for Middlebury’s endowment in the fiscal year ending June 30, 2018. Thanks to the solid return and to gifts received during the year, the value of Middlebury’s endowment ended the year at $1.124 billion—an increase of $50 million. Last year’s performance boosted the endowment’s 3-year annualized return to 6.0 percent, the 5-year return to 8.2 percent, and the 10-year return to 7.4 percent. The annual and 10-year returns both surpassed Middlebury’s own benchmark (75 percent global equity/25 percent Treasury securities) of 7.6 percent for the year, 7.7 percent for five years, and 5.7 percent over 10 years. Middlebury’s endowment is managed by Investure, a firm based in Charlottesville, Virginia, that manages the endowments of colleges, universities, and foundations with a total value of more than $13 billion. Investure began managing the Middlebury endowment on May 31, 2005. 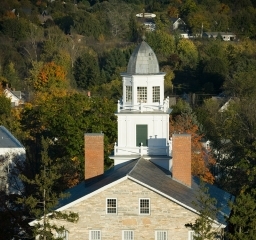 The Middlebury endowment supports all of Middlebury’s schools, including the undergraduate College, Middlebury Institute of International Studies at Monterey, Middlebury Language Schools, Schools Abroad, Bread Loaf School of English, Bread Loaf Writers’ Conferences, and School of the Environment. Last year Middlebury drew $66.8 million from its endowment to support its operations.